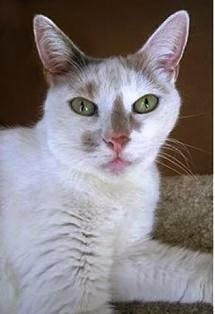 Melissa's Mochas, Mysteries and Meows: Introducing Our PAWS Sponsor Kitties!!! I specifically requested to sponsor Truffle, not just because of her totally pawsome name *s* but also because I blogged about her once before. Can you believe this little beauty has been at PAWS since January 2009! How is that even possible? She is such a beauty! I'm going to allow Truffle to tell you more about herself, and please spread the word that she has been looking for her forever home for far too long. Her adoption application can be found here. Watch where you're walking because I love to weave in and out of people's legs. I also love to rub my cheek and neck on your shoes. But feel free to bend down and scratch under my chin, behind my ears and rub my head. Leave the rest of my body alone though please. I'm a good-looking girl – my tabby stripes look almost golden in the sun! There's nothing more that I would love than a sunny spot to lounge in, space to run around and play and finally to be the center of your attention. Except in the morning - I am most definitely not a morning cat. I'm often passed over by potential adopters because I'm too independent. I'm just not a cuddly lap cat. I also have a condition called Stomatitis. Feline stomatitis is a common and painful problem in many cats. It is a chronic inflammation and ulceration of the soft tissues in the mouth. I currently don't need my medication and am doing very well. I am on a wet food only diet. I’m 10 years old and would prefer to be an only cat in a quiet household (no children or dogs please). I'm spayed, current on all my vaccinations, microchipped, and I've tested negative for FIV and FeLV. So please, walk on down to Paws and ask to meet me. You won't help but fall in love with me - if you don't trip over me first. Have you heard about how Joan Rivers included her beloved dogs when she took care of her estate planning? It's a wonderful lesson for us all. It breaks my heart to hear of pets that end up in an animal shelter because their owner has passed away and no directives were left for their care. That is exactly how sweet Cinnamon ended up at PAWS. 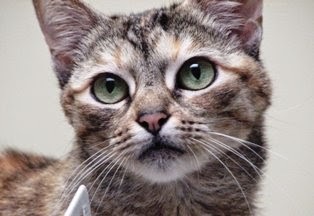 Can you give her the new forever home that she's looking for? Her adoption application can be found here. Cinnamon is a great 14 year old lady who loves a good lap. She enjoys eating and lounging. Cinnamon came to us when her elderly owner passed away. She does fine with children and other cats. Cinnamon is on a special hypoallergenic diet that can be purchased at a pet food store, but does cost a little extra money. She also has hyperthyroidism which means she requires a pill twice a day which she takes in a treat pocket, so it is no trouble. Cinnamon also has a thing for towels and we supply her with one to pee on once daily. She never pees anywhere else except the towel and the litterbox. As you can see, Cinnamon has some quirks, but she is worth it! I am already completely in love with my sponsor kitties, and would adopt them both myself in a heartbeat if it was at all possible. (Although having a Truffles and a Truffle in one house might get a bit confusing!) Truffle and Cinnamon will be appearing on our blog in the coming weeks, perhaps even for Caturday Art and Sunday Selfies features! What a couple of gorgeous gals! How lucky they are for you to sponsor them. We wish them tons of luck on finding their furever home. Aaaaw They awe pawsum. Meez so sowwy dat Truffle's been there so long. Weez not unnewstand dat at all. Weez fink they shuld boff hav da bestest most purrfect furever home evew. Weez be purrayin' and shawin'. Fanks fur sponsowin' such wunnewful and needy kitties. Truffle sounds a little like Jewel - she was a pretty independent cat and didn't sit in laps or cuddle, either. It's so nice that Cinnamon takes her pills so well! Both sound like really nice kitties. I hope they both find wonderful homes soon. They are both beautiful and sound very sweet. You are so kind to sponsor them. I pray they find forever homes soon. Aw, Truffle and Cinnamon are gorgeous! Thanks for sponsoring them. Those look like very sweet girls and we are so glad you are able to sponsor them!! Thank you, Melissa and Truffles, for sponsoring our pals Cinnamon and Truffle. They are both wonderful and sweet, and we love them both so much. Truffle may not be a lap cat, but she *always* greets us happily when we visit her room. And she like to play, too. :) Cinnamon is just a little lovebug ... always wanting to be close by, or on our laps. Thanks again for your kindness. We'll be sure to give Truffle and Cinnamon some extra scritches for you, and try to get a few extra pictures of them to send you the next time we volunteer. Beautiful. Hope they get adopted. Shared. They are both so beautiful. WE hope that their forever home finds them. So many need homes. It is a big wish of ours that they all had good homes. How adorable!! Yay for you! What sweeties these two kitties are. And what a beautiful and generous thing you're doing for them. i hope that both of you beauties get adopted soon. Mariodacat had stomatitis, and after having all his teeth pulled, he's doing great. You should put them on your sidebar. Such cuties. Concats on “adopting” them. They are BEAUTIFUL! We can't believe that Truffle has been at the shelter for so long... that is heartbreaking. And Cinnamon sounds like a funny kitty. We wish we could adopt them both too. How sweet of you to sponsor them.